This is an oil drain coupling fitting that replaces the original oil pan drain plug. It has an o-ring sealed spring loaded valve that is opened as a drain tool is attached and closes as it is removed to allow for a gravity style oil change. The drain tool is normally sold with a short length of open ended clear hose for draining oil into a drain pan but can also have a quick disconnect hose end fitting attached to allow for vacuum extraction. 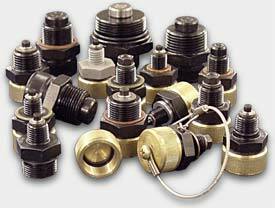 The plugs are also available with a stainless steel safety lanyard for aircraft and crane applications. This product is a stand alone product that does not require the purchase of the TT-28 or the OD-28. Typical uses are for fleet service centers that must have access to the bottom of a vehicle to change the oil filter, and these plugs allow for a quicker, cleaner and safer method of draining the oil.